Ringneck Parakeets are growing in popularity among aviculturists and pet lovers around the globe. 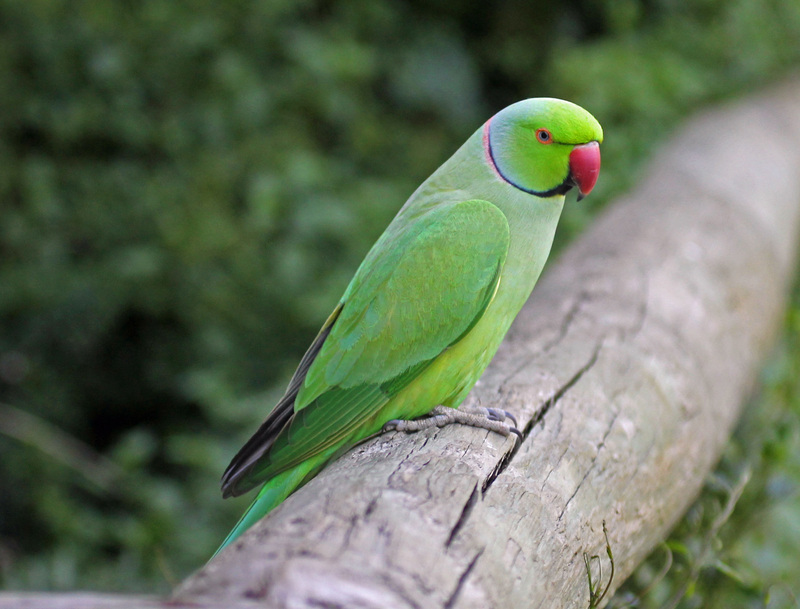 The African Ringnecked Parakeet is also known as the Rose Ringed Parakeet. Like all Ringneck Parakeets the African Ringneck is easy to teach and tame. African Ringnecks, while possibly common in African aviculture, they are extremely rare in United States aviculture, forsaken for their more colorful Indian counterparts. Regular handling is needed to maintain your tamed Ringneck’s friendly personality. If they are not given the proper amount of attention, they may grow unfriendly and can become nippy. These are social birds and they must have plenty of attention given to them every day, particularly if they are kept singly. Some have reported that males make better pets, but others report that females make equally good pets, provided they receive enough love and attention. Some Ringnecks make excellent talkers, though this is never a guarantee. All of the Ringnecks are highly intelligent and require plenty of toys to keep them stimulated. The African Ringneck is sometimes confused with the Indian Ringneck. Separately they may seem quite similar, but if they are placed next to each other the differences are readily apparent. 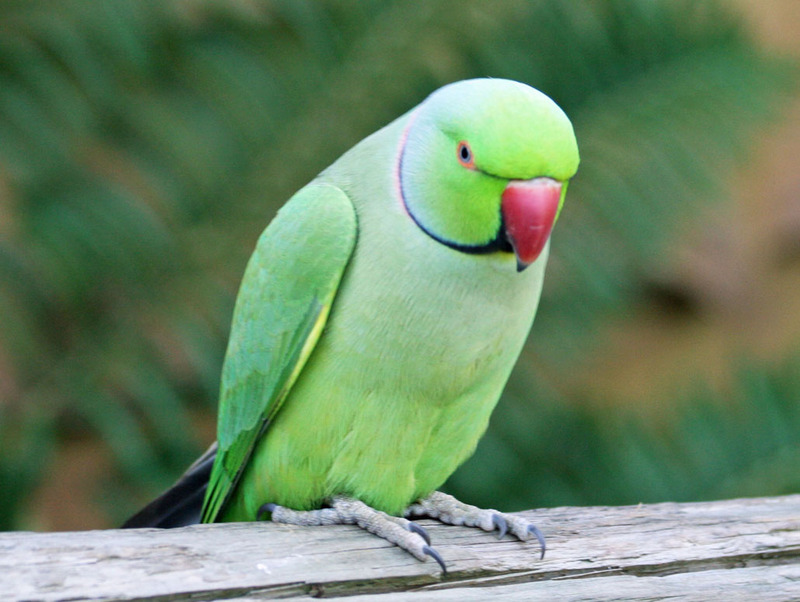 The Indian Ringneck is larger than the African. The Indian Ringneck usually measures 16 inches in length, whereas the African Ringneck averages a mere 14 inches. Both male and female African Ringnecks have dazzling long tails, noticeably longer than those of the Indian Ringneck. 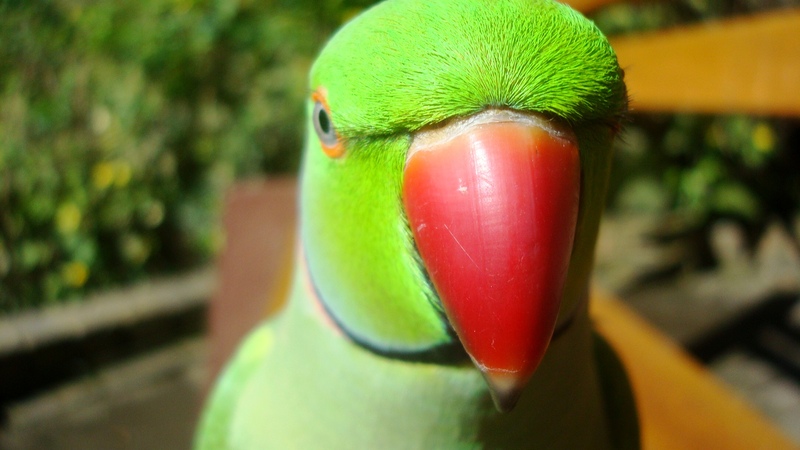 Mature African Ringnecks have plum colored beaks and pale yellow eyes. Males and females can be distinguished visually. Males have a largely green plumage with yellow-green feathers appearing under the wing covets. They have wide black bands on their cheeks and black chins. True to their names, they have a rose pink ring on the back of their necks. The females do not have the black markings on their cheeks or chin and are lacking the pink ring. They also have shorter tails than the male. Their grey eyes easily distinguish immature individuals from adults. Aside from their grey eyes, immatures largely resemble the females. 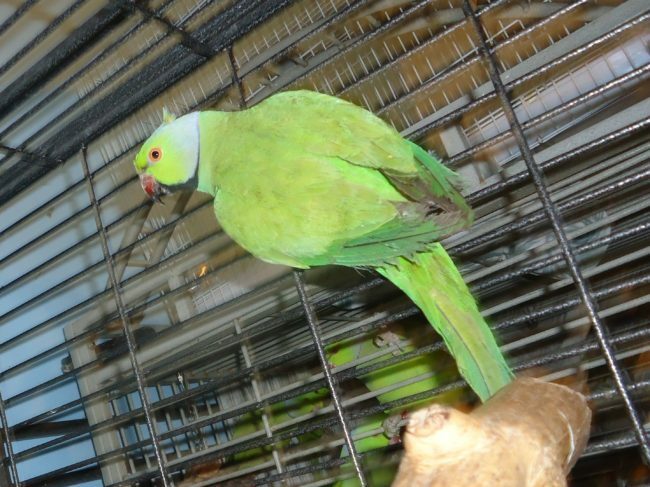 Unlike the Indian Ringneck, the African does not have a multitude of color mutations. At this time, however, there is a lovely blue mutation, though it is quite uncommon. As its name might suggest, the African Ringneck is native to Africa. It is most common in southern Sudan, Guinea, southern Mauritania, Senegal, and western Uganda. The African Ringneck is not difficult to care for in captivity, but if they are kept singly as pets, they require a lot of attention to maintain their tameness. They are avid chewers, and toys must be provided to prevent destructive behavior. The African Ringneck male will reach sexual maturity at approximately 18 months, but males may not breed for as long as 3 years. 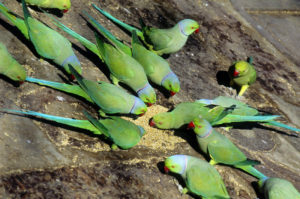 African Ringneck Parakeets are bred regularly in captivity. If you keep your breeding pairs in group aviaries, some aviculturists advise separating pairs before breeding and leaving them separated from the group throughout the breeding season, as they may become aggressive at this time. In captivity the breeding season of the African Ringneck is variable. If your aviary is indoors they will usually begin breeding in December. In outdoor aviaries some pairs may breed as early as February, and this can be a problem. In order to avoid early breeding (which may cause egg binding) it is suggested that nest boxes be removed until April. The average clutch size is 3 to 5 eggs. The incubation period lasts an average of 23 days, and babies fledge in 7 weeks.